As a sanitary landfill, every day when trash gets dumped there, it’s covered up within a few hours. The waste pickers have a limited time frame to collect recyclables before they’re buried. Started in 2009, the waste pickers’ association is the first to exist in the Dominican Republic. Felipe says 523 waste pickers – the majority of which are men – work on the landfill and all are members of the association. Felipe says that in April 2009, the waste pickers ran into a problem when the engineers in charge of the sanitary landfill decided to impose their rules, including deciding how many people could work at the landfill. When the waste pickers began protesting, Felipe says, the managers of the landfill reacted unjustly. “The scandal was so big” that it attracted the attention and support of Red Lacre and human rights organizations. The waste pickers have continued to develop relationships with several organizations. In March of this year, a pilot project – a recycling plant – was inaugurated. Felipe says the plant is not operating yet but that at first, 14 waste pickers from the association will work there. That number will grow to 150. He says the idea behind the project is to improve the working conditions of waste pickers. It will eventually become the first recycling plant managed by waste pickers working in coordination with the city government. 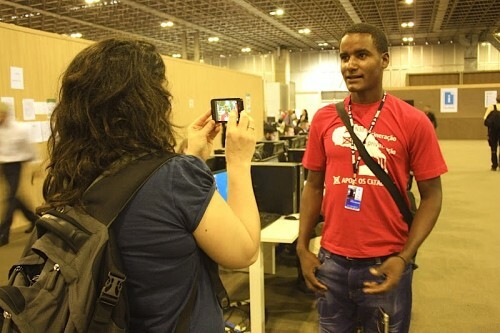 In June of 2012, Felipe had the opportunity to participate in side events at Rio+20, the U.N. Conference on Sustainable Development as well as the People’s Summit, the alternative space that gathered thousands of social movements and members of civil society. Right now, Felipe is working towards the formation of a national network of waste pickers in the Dominican Republic.